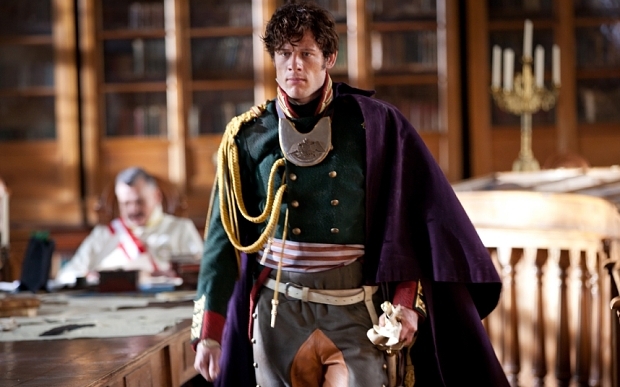 I’m not going to rant on and on about it BUT after throwing myself into Tolstoy’s War and Peace, wading through pages and pages of tedious battles, but loving the characters and drawing room scenes, getting all excited about the BBC production, and finally seeing the first of the four part mini-series last night, I am tremendously disappointed in the American channels’ airing of the show. The program itself is beautiful. 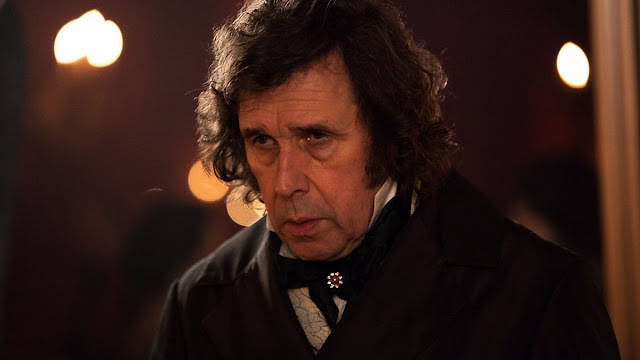 Andrew Davies, the screenwriter, has condensed Tolstoy’s words, taking characters and putting them together much sooner than in the novel. 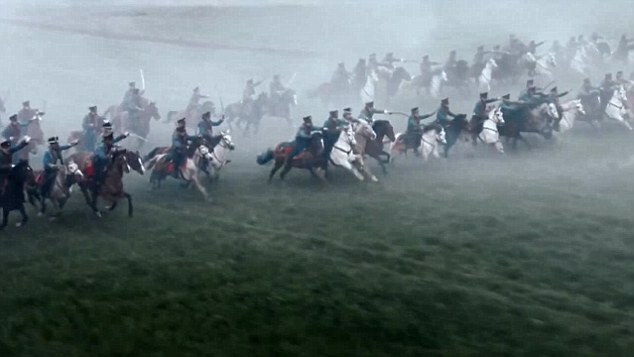 The battle scenes, which I found somewhat tedious reading, were cut to the bone. Only the important, dramatic bits survived. 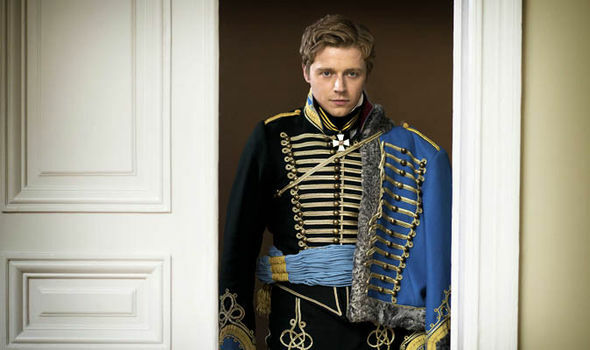 The cast, from acclaimed actors like Jim Broadbent as the older Prince Bolkonsky and Stephen Rea as Count Kuragin, to newer faces like Jack Lowden as Nicolai Rostov, performed quite wonderfully. The key trio didn’t disappoint. 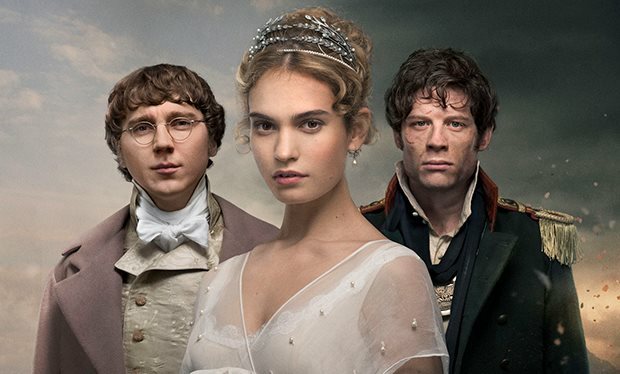 Lily James sold her young girl status enthusiastically as Natasha, Paul Dano was perfectly bumbling as the weak-willed, easily-led Pierre Bezukhov, and James Norton was beautifully stoic and ultimately heroic as the unhappy young Prince Andrei who doesn’t love his wife, and sees little joy in life. The costumes by Edward K. Gibbon were impressive; the soldier’s lush uniforms with jackets dangling from their shoulders, the men garbed in snappy topcoats, breeches and boots, the fresh approach to the female costumes with quite modern-feeling dresses worn by Gillian Anderson as Anna Pavlovna Scherer and Tuppence Middleton as Helene Kuragin, were all award-worthy. 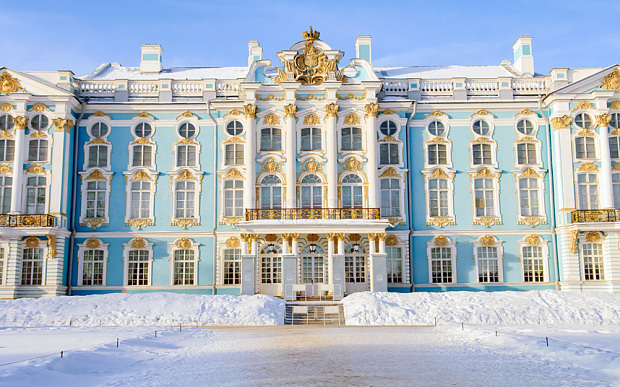 St. Petersberg was dazzling in the pure white snow, the old buildings’ like freshly decorated cakes with white and pastel frosting, the interiors vast and period perfect. I certainly couldn’t tell where St. Petersberg ended and Latvia—where most of the production was shot—began. And nor could my husband who had the pleasure of working in that gorgeous city on Anna Karenina, the 1997 version with Sophie Marceau and Sean Bean. If I had one tiny quibble, it would be the way the cinema tographer used shafts of light coming in the windows in the daylight, casting a glare over the character’s faces at times. Realistic, just not my cup of tea. But, all in all, it’s a lovely, fresh retelling of a classic. Which is why I was so upset with the mega-number of lengthy commercial breaks. Just when I’d get wrapped up—bam—commercial! And not just a short commercial like they do on Hulu, but seemingly ten spots in a row. There’s a plus to that of course: plenty of time to refill the wine, make a snack, take a bathroom break, but it really ticked me off. There’s nothing I like better than watching a really good program and getting wrapped up in the drama the way I would watching a movie in a theatre. The way I watch Downton on Masterpiece on PBS. The way I watch most of the television dramas that I watch, which is commercial free on Netflix. 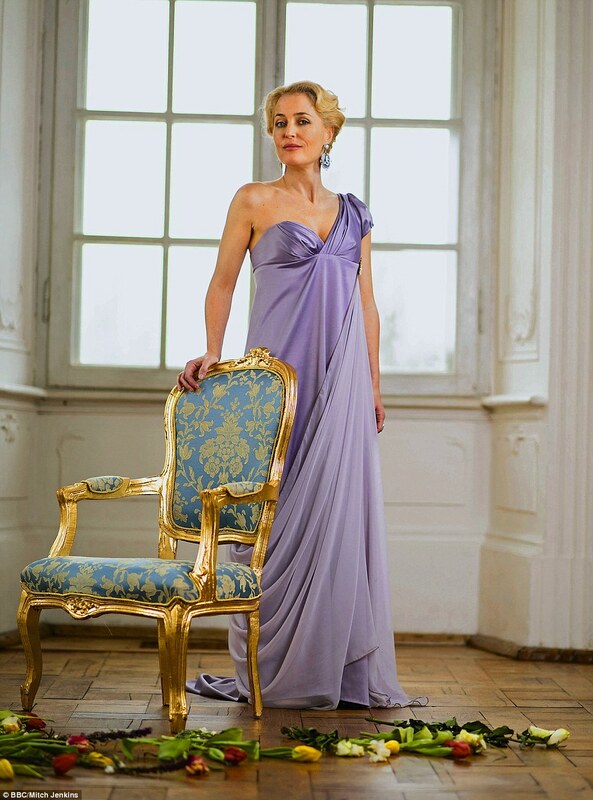 Lifetime, A&E, The History Channel could have presented War and Peace more deferentially but TV is their business. It’s not public programming and they clearly care more about maximizing their profits than they do providing the audience with the best program possible. The director, Tom Harper, his cast and crew deserved better than that. Despite that large grumble on my part, at the end of the day, when James Norton’s Prince Andrei is left for dead on the battlefield and proclaimed a hero, and Jim Broadbent as his curmudgeonly, unemotional father sends his daughter away, all to be left alone so he can cry quietly into his hands, I was deeply moved. And unless I can find a way to watch the BBC’s commercial-free presentation, I imagine I’ll be tuning in for episodes 2, 3 and 4. Prince Andrei and Natasha haven’t even met yet; I don’t want to miss that. Curses, corporate controllers of the world we live in, you win again! Sim, I DVR-ed this and I started to watch it yesterday but had to stop. Grace was diagnosed with a concussion, so she sat facing me (she's not allowed to watch TV) listening and I tried to describe what was on screen and who the actors were. But it was too difficult to capture all the people and grandeur. We'll have to wait until she can watch too. She, of course, recognizes all the actors. So I'll look forward to seeing the whole thing while fast forwarding through all those commercials.